Great review! It’s always good to see the good review sites continuing to evaluate knives in the lower and middle tiers, instead of just customs and high-end production knives. Us enthusiasts still need knives that we can beat on and not worry about damaging or losing, or loaning out as needed. I’m carrying a Nirvana right now, but if I needed to do something abusive I would go grab my Oso Sweet or Skyline instead. 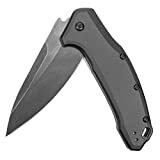 Kershaw and CRKT seem to be the best bets for a great knife at $50 or less, with Byrds and the lower end of Spyderco’s range overlapping that a little bit. Thank you, Patrick. I am still very interested in budget knives for the exact reasons you mention. While I own knives that are essentially collectibles, I still carry and use knives all the time. A good portion of my EDC rotation is made up of knives under $50. BladeReviews will continue to cover this segment of the market. I think it’s worth mentioning that (like the Skyline and Blur) Kershaw is releasing limited runs of the Link in different colors and steels. House of Blades has one in blue and S30v, I believe. I also agree with Dan, re: Kershaw and middle tier USA made knives. The Chinese stuff (and even ZT, to an extent) distract from their real talent: making high value US made knives. Grayson, You make an excellent point about the limited editions. I will update the review as that can get around the complaint that the steel is not particularly good. Thank you. There is a version with upgraded materials. House of Blades has a model with S35VB blade (stonewash or blackwash) and red or blue aluminum handles for $80. How do you feel about that? Chad, The anodized handles don’t do anything for me, but I think the S35VN gets around the complaints with 420HC. Not sure if it’s worth double the price. If Kershaw did this as a non-limited release and it retailed for closer to $60 then I think it would be a screaming deal. At $80 plus shipping I’d say buy it if you really like the design, but for close to $100 I’d probably save a little more and go for a Griptilian, Sage 1, or Para 2. They did just release the dimascus version as well. Looks great paired with the grey handles. That’s great. This is a nice design, so it sounds like Kershaw is going to run with it. I hope it sells well for them and we get a number of different versions. I knew Kershaw was going to do more with this knife. I have both models in straight, tanto and serrated blades and I love them. I saw the blue limited edition model with the better steel but haven’t bought one yet, but will soon. I’m excited to hear about a Damascus model as well. I told my friends when this one was first released it would be the next knife that Kershaw would do something with to make them collectible a few years from now, much like the older Zing, OD-1, Ram, etc., etc. Thank you, Rob. I am glad you enjoy your Links. It’s a solid design for sure. Congrats on acquiring the new Damascus version as well. I haven’t been following Kershaw’s value segment too closely, but offhand this looks like the best knife they have produced in a while. It could very well be the next Zing, OD-1, etc. The limited releases are certainly a step in the right direction. Just bought a Link 1776GRYDAM at BladeHQ for 85.95. I got the Damascus Link a couple weeks ago and thought I would make a comment about the lines in the Damascus which are more pronounced on this knife than any other Damascus I own. If y’all like the Link you should check out the Damascus, you won’t be disappointed. I picked up the FRN handle version today. The scales do have kind of a cheap look and that plastic feel but it just felt grippier to me than the aluminum when I handled it. The plastic handled version is probably more practical. I agree that G10 would be the best of both worlds here. I hope you enjoy your Link. Thanks for stopping by.